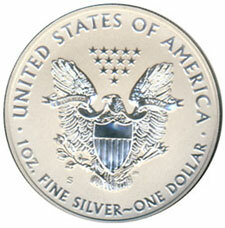 The American Silver Eagle is one of the most popular modern coins produced by the United States Mint. Struck in one ounce of .999 fine silver, the coins feature the classic Walking Liberty design by Adolph A. Weinman on the obverse, paired with a heraldic eagle design by John Mercanti on the reverse. For the coming year, the 2013 Silver Eagles will be available in bullion format along with a number of options expected to be released for collectors. The 2013 Silver Eagle bullion coins are scheduled to go on sale to authorized purchasers on January 7, 2013. Soon after this date, the coins should become more broadly available to the public. Typically, there is a surge demand for Silver Eagles in the month of January, as dealers and collectors rush to purchase the newly dated coins. This year, the impact may be magnified due to the early sell out of the 2012-dated Silver Eagles in mid-December. In addition to the usual spike in demand for the newly dated coins, there may be additional pent up demand following the three week gap in availability for the popular bullion offering. The United States Mint has scheduled to release the 2013 Proof Silver Eagle on January 24, 2013, which is more than two months earlier than the prior year. Proof coins are struck with a specialized minting process that involves striking a coin multiple times with specially prepared dies. The resulting coins feature frosted images and inscriptions against a deeply mirrored background for cameo effect. Proof coins as well as other numismatic versions of the Silver Eagle are sold directly to the public. Preliminary pricing for this year’s individual proof coin has been indicated at $62.95. This represents a $3.00 increase from the price in place for the prior year offering when it sold out in mid-November. In May 2013, the Mint is expected to release the 2013-W Uncirculated Silver Eagle. This represents a second collector version of the coin which is struck on specially burnished blanks and carries the “W” mint mark. The Mint has offered the collectible uncirculated Silver Eagle with “W” mint mark from 2006 to 2008, and from 2011 to present. Preliminary pricing for next year’s coin is indicated at $53.95, representing an increase of $3 over the price of the 2012-dated version which still remains available for sale. Finally, the Mint is expected to release a special two coin collector set, to mark the 25th anniversary of the West Point Mint gaining mint status. Although the facility was erected in 1937, it did not gain official status as a branch of the United States Mint until March 31, 1988. According to preliminary information, the set will contain one reverse proof Silver Eagle with “W” mint mark and one uncirculated Silver Eagle with the “W” mint mark. Reverse proof coins feature the opposite effect of the typical cameo proof. The background fields are frosted, and the design elements and inscriptions are mirrored. 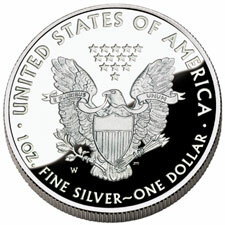 Reverse proof Silver Eagles have previously been offered within special collector sets issued in 2006, 2011, and 2012. The 2013 West Point Silver Eagle Set is expected to be released in the May/June 2013 time frame. The offering may follow a similar format as the 2012 San Francisco Silver Eagle Set, which was minted to demand based on orders placed during a one month window. Pricing for the West Point Set has not yet been determined. The San Francisco Set was priced at $149.95. There may be other numismatic products including the American Silver Eagle in the coming year. In 2012, the Mint offered the Annual Uncirculated Dollar Coin Set, which included examples of the Presidential and Native American Dollars along with a collectible uncirculated Silver Eagle. In 2012, the Mint introduced the Limited Edition Silver Proof Set, which included eight 90% silver coins and a proof Silver Eagle. It is not yet known whether these products will reprise their appearances in 2013.